← Budget wireless headset S530. Hello, friends. I want to tell you how I made the knife. This is not the first knife. It’s just a budget and affordable for all knife. Either it can be repeated. 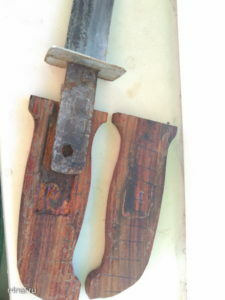 For knife needed: Cutter blade 450h32h1.6 steel R6M5. Price of new cloth around $ 6. Two tablets, preferably beech, oak, elm … In my example rosewood (once more bought amaranth and wenge wood is also good). Blade from the saw blade saw in half. Propyl do “under the slant.” Next to treat sandpaper, sharpen. We get 2 blades. From any of the aluminum sheet plate with a slot do. In the wood under the handle aperture do by the blade. Joiner’s glue glue stick. Handle wrapped with a rubber band to a well squeezed. 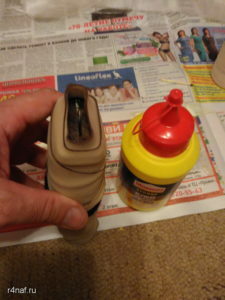 When the glue is dry, pour into the inner opening epoxy resin. Insert the blade. leave to dry. 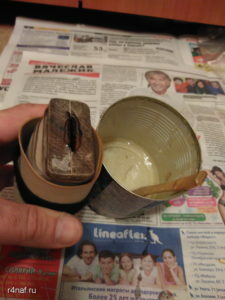 After drying process the handle poshkurim sandpaper, and all knife ready! One time I wet hand. And I had the imprudence to put the knife on the radiator. The first time I glued the handle only epoxy. That was not right. 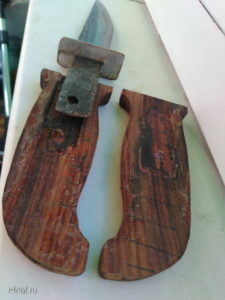 After drying, the handle is cracked along the seam where the pitch was. Are glued handle only a good carpenter’s glue. In the photos you can see how I redid the handle. This knife can shave! I grind it to a razor’s edge. 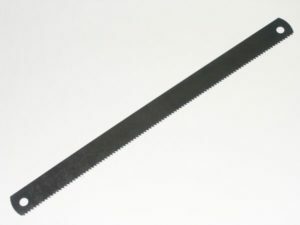 So, I recommend to buy the saw blades of steel R6M5 and do homemade, not complicated, but very reliable blades. I do not handle right thing the first time. Only glued with epoxy resin and slightly pressed. 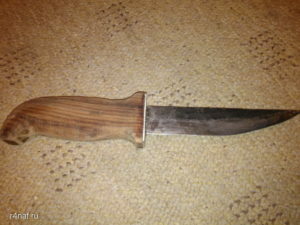 This entry was posted in Hiking equipment and tagged a knife with his hands, budget knife, coltello, couteau, couteau de fabrication artisanale, couteau self-made, cuchillo, cuchillo de fabricación casera, cuchillo de presupuesto, einfache messer, faca, hausgemachte messer, homemade knife, homemade knife in 1 hour, homemade knife out of the saw, homemade knife R6M5, knife, Knife for a hike, messer, R6M5, simple couteau, simple cuchillo, simple homemade knife, uma faca simples, un cuchillo con las manos, un semplice coltello, un simple couteau, бюджетный нож, нож, нож для похода, нож своими руками, простой самодельный нож, Р6М5, самодельный нож, самодельный нож за 1 час, самодельный нож из пилы, самодельный нож Р6М5. Bookmark the permalink.